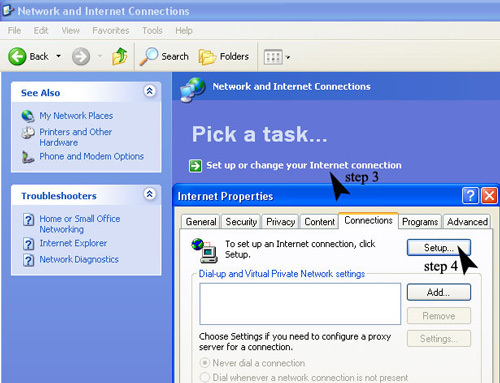 Click on the "Start" button and select "Control Panel"
Open "Network and Internet Connections"
Click on "Set up or change your Internet connection" to open the Internet Properties panel. Click on the "Setup..." button to start the "New Connection Wizard". NETWORK CONNECTION TYPE = "Connect to the Internet"
GETTING READY = "Set up my connection manually"
INTERNET CONNECTION = "Connect using a dial-up modem"
Type in the user ID (the first part of your email address) and password you received from the office (usually on a white registration sheet). Click on the "Add shortcut to my desktop" Then click "Finish".